Bournemouth centre-back Ake got the equaliser past the hosts two minutes from time, and almost added a second in injury time. 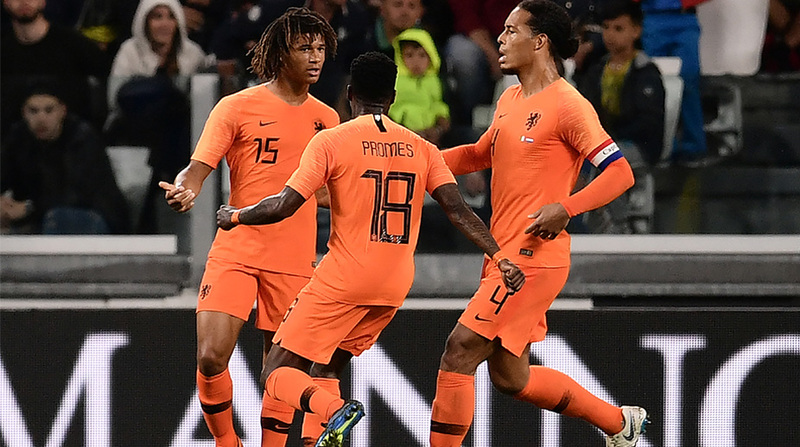 Nathan Ake headed in a late equaliser as the Netherlands held 10-man Italy 1-1 in an international friendly in Turin between two heavyweights who failed to qualify for the World Cup. Simone Zaza had put Italy ahead after 67 minutes in Juventus’ Allianz Stadium but the hosts were hit two minutes later when defender Domenico Criscito was sent off for a tackle on Ryan Babel. Both sides are rebuilding after failing to reach the World Cup finals in Russia. New Italy coach Roberto Mancini’s first three games in charge have resulted in a 2-1 victory over Saudi Arabia, 3-1 defeat by France, and 1-1 draw against the Dutch. “It was a friendly, I don’t know if that was really a red card,” said Mancini. “Nevertheless it was an enormously naive error. Playing down to 10 men for 20 minutes was tough, as we were already feeling tired.” Mancini said he was optimistic with what he had seen in his first two weeks in charge. “It’s difficult after 10 days to develop really complex tactical situations, but we saw some good things against France and again today,” said the 53-year-old. “We’ve got to get playing and gaining experience and that’s what the friendlies are for. The Dutch are also forging a new era under Ronaldo Koeman after failing to qualify for both Euro 2016 and the World Cup. Four-time world champions Italy proved wasteful in the first half despite dominating play with chances from Andrea Belotti, Simone Verdi and Criscito. Torino striker Belotti — starting in place of Mario Balotelli — had the ball in the net within three minutes but the goal was ruled offside. Lorenzo Insigne — wearing the captain’s armband on his 27th birthday — then set up Verdi who fired over, with Criscito’s header cleared off the line by Ruud Vormer. Koeman’s side got into their stride more after the break but Italy nevertheless opened the scoring when second half substitute Zaza picked up a Federico Chiesa centre. But minutes later Criscito was sent off for a mistimed tackle, giving three-time World Cup runners-up the Netherlands a numerical advantage. “I’m happy with the goal because I had sad memories of the national team, I felt a little emotional,” said Zaza, who has been recalled by Mancini having not played since missing a penalty kick in Euro 2016 against Germany. “We’re a young group and we need time to prepare. Unfortunately in a way we have a lot of time to prepare for the next tournament.” The Dutch — World Cup runners-up in 2014 — follow last week’s 1-1 draw against Slovakia, having beaten Portugal 3-0 last Match. For Italy it was another 1-1 draw in Turin after recent games against England, Spain and Macedonia.